If you want to know what a Greek Pinot Noir style varietal should taste like, this is the wine for you! Mykonos screams Old World (from 476 A.D.) and is nicknamed “Wine of Hercules”. It’s light and delicate with mellow tannins and bright acidity. All Georgos wines are handcrafted in small batches with premium, imported and sustainable fruit with no added sugar and low sulfites. 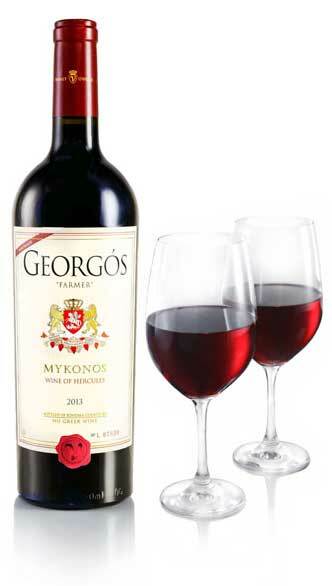 Georgos Super-Premium Greek Wine is a collaboration of the best of the Old World and the Nu. This wine is named for the ancient Greek island (circa 3,000 BC) of Mykonos, where a great battle took place between Zeus and the Titans. This varietal from 476 A.D. is also known as the ‘Wine of Hercules’, and it was a palace-favorite of King Agamemnon who led the Greek forces during the Trojan War. Our winemaking is cutting edge, clean and very green. We hand pick and hand- sort the clusters, de-stem the berries without crushing, mechanically shake out the small shot berries and then hand-sort again to remove anything that isn’t perfect. Good fermentation management helps produces wine that is stabile and clean, with very low histamines, which may cause headaches. Little sulfite was necessary so when the wine is consumed the sulfite level is well below human threshold. Each lot was kept separate, with individual protocols and barrel programs. The fermentation was started on native yeast with a pure strain added later. The yeast was fed regularly to keep them happy. If you want to know what a Greek Pinot Noir varietal should taste like, this is it. The nose is a strawberry patch with a touch of allspice. The first taste sensation is toward the center of the palate then rolls forward in a cresting wave. Long, mellow tannins lead to a lingering finish. The wine is light and delicate; this is the Greek Pinot Noir. This style wine, pairs well with a wide variety of foods complimenting low acid food like ham or chicken and contrasting with higher acid foods like tomato sauced pasta. We serve it slightly chilled in the summer, similar to a white wine. It’s pleasing and versatile in any setting.